On May 3rd 2016 a wildfire swept through Fort McMurray forcing more than 88,000 residents to evacuate. Due to the unprecedented conditions many families were forced to leave their pets behind as returning home was not an option. 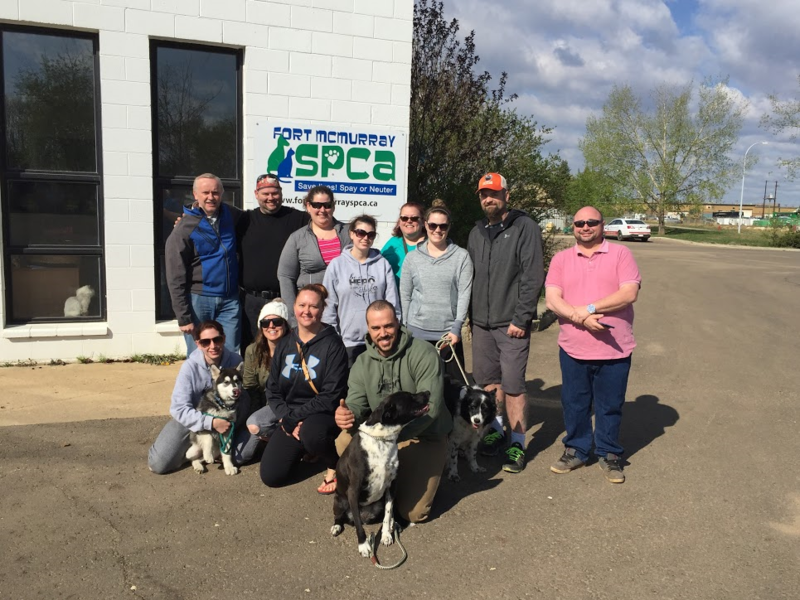 The Fort McMurray SPCA played a supporting role to the Regional Municipality of Wood Buffalo (RMWB) Bylaw Services Animal Control who was the lead agency in the pet rescue efforts. 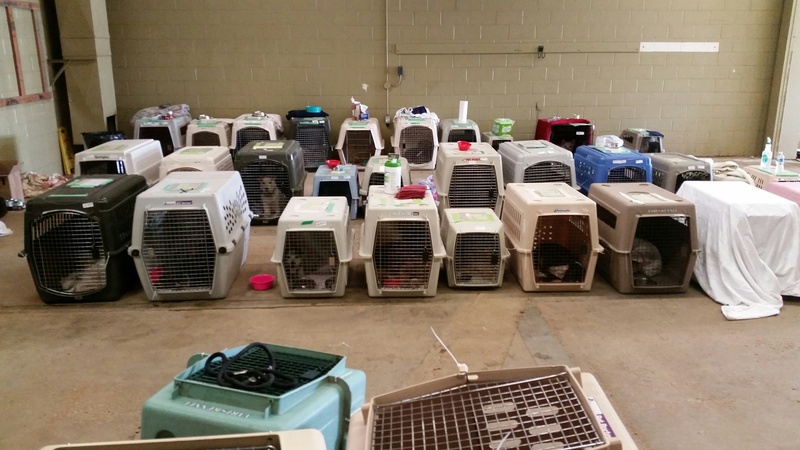 The RMWB seconded the services of numerous animal welfare agencies to not only provide support and expertise during the pet evacuation but also during the reunification process. These agencies included: Alberta Animal Rescue Crew Society, Alberta Spay Neuter Task Force, Alberta Veterinary and Medical Association, Barrhead Animal Rescue, Calgary Humane Society, Canine Action Group, Central Alberta SPCA, Edmonton Humane Society, Global Animal Lovers, Klassic Kennels, Saving Grace Animal Sanctuary, Second Chance Animal Rescue. 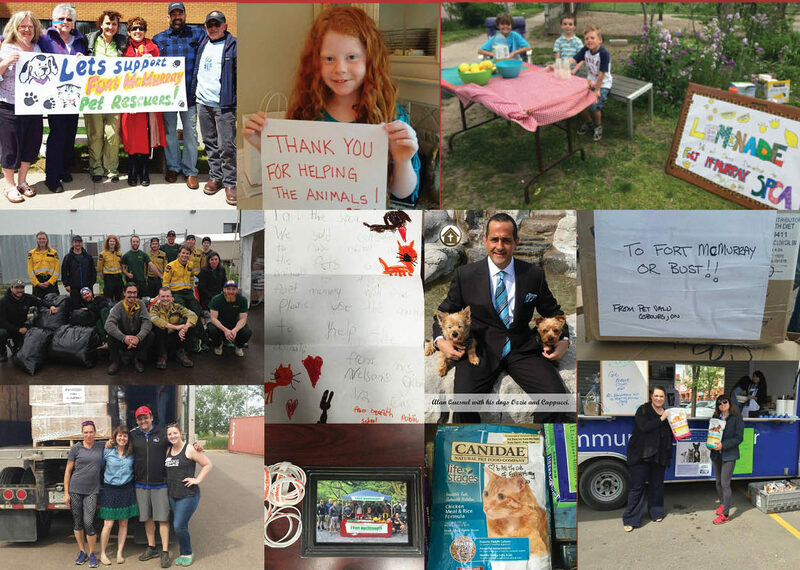 On behalf of the Fort McMurray SPCA and regional pet owners, we want to thank these agencies and all of those who supported our community from locations across the province and the country for helping to save lives and make a difference. We are forever grateful for your efforts during that time. 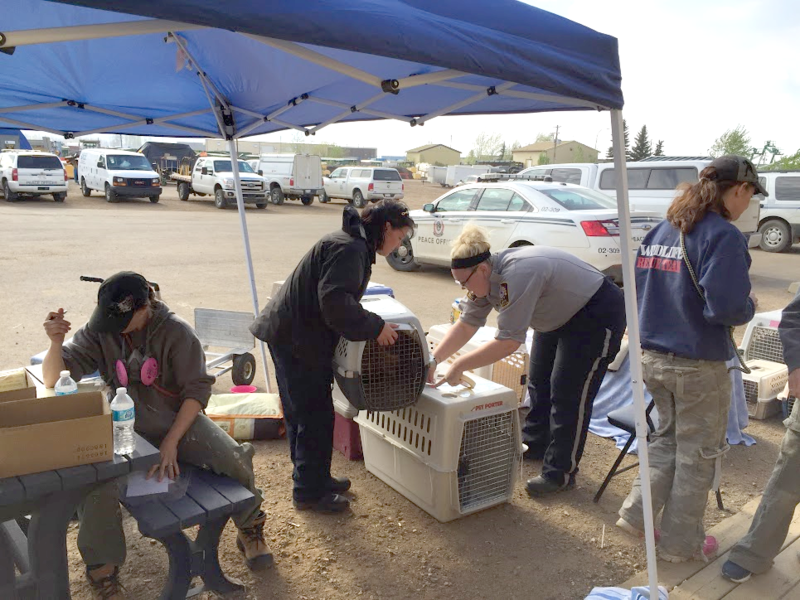 The Fort McMurray SPCA shelter evacuated the evening of Sunday, May 1st when a voluntary evacuation order was issued for the neighborhood in which the shelter is located. The pets in our care at the time were placed with local foster families in neighborhoods under less threat to keep them safe until the Gregoire neighborhood was cleared. That evening we also provided pet food and supplies to the RMWB. Although the evacuation order was downgraded to shelter in place on Monday, we decided to leave our shelter pets with their foster placements until the neighborhood was cleared completely as this was one of the few areas in the city impacted at the time. By 2pm on Tuesday, many of our employees who lived in the most impacted neighbourhoods of Abasand and Beacon Hill were under a mandatory evacuation. Like thousands of others, many of our staff lost their homes and everything in them. 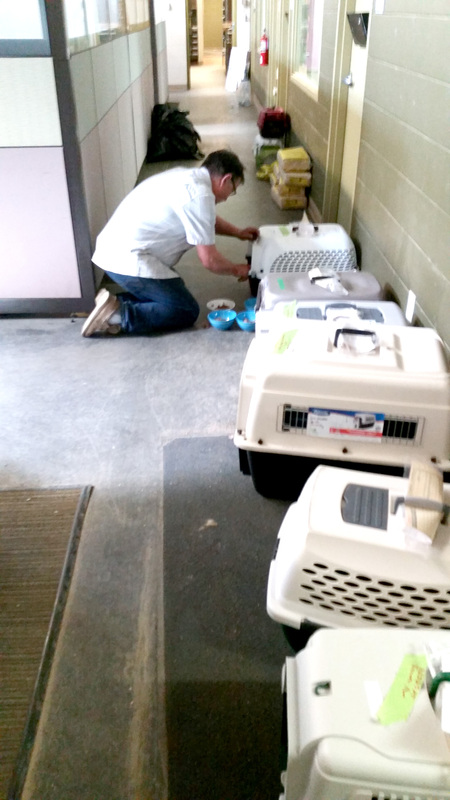 Our devoted foster families not only safely evacuated themselves and their pets, but the FMSPCA pets in their care as well. In some cases we arrived at evacuation centres in the region only to have to evacuate a second time as the wildfires continued to grow. Our staff, board and volunteers, like so many of the 88,000 souls evacuating were scattered over hundreds of kilometers and locations in Alberta and beyond to find shelter and safety with friends or family. Our community was under a declared state of emergency. 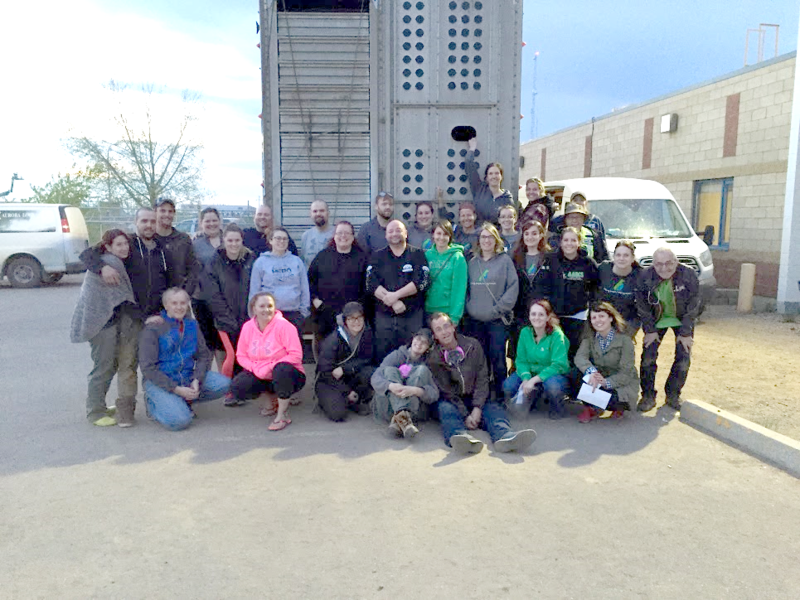 In response to the hundreds of messages we received, on Thursday, May 5th, we made a formal request to have an FMSPCA contingent re-enter the community to support and participate in the emergency pet rescue operation lead by the RMWB which was to use the Fort McMurray SPCA shelter, its resources and clinic as its base of operations. The rescue was scheduled to take place over a 96 hr period. 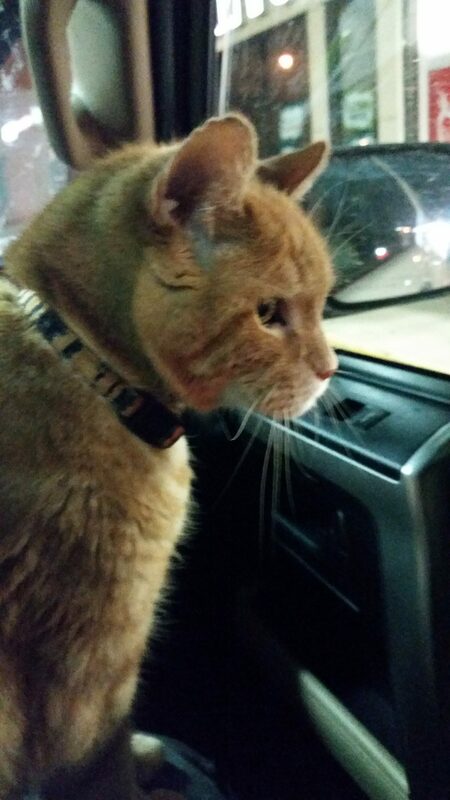 On the morning of Friday, May 6th less than 72 hrs after being evacuated, a small team of staff, volunteers and board members made the drive back from our evacuation points to support pets still in our community. When we arrived at the security checkpoint south of the city the smoke and fires on both sides of the highway as we made our way back to our shelter was a very sobering welcome. Our shelter was impacted by the heavy smoke, there was no running water and no electricity. 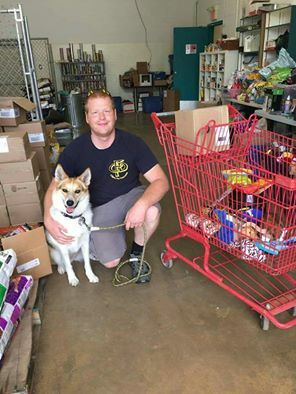 Our team, who has emergency response experience and training, began the task of organizing, auditing and gathering our pet food and supplies. Getting our shelter phone system to forward to cell phones so that calls from our community could be answered in real time. Supply and volunteer lists were developed and submitted to the RMWB for approval and procurement. The shelter was readied to triage, care for and house pets who would be extracted and sheltered until they could be transported out of the emergency zone. Over the duration of the pet rescue efforts our team helped to catalogue, feed, clean and care for: geckos, birds, snakes, rabbits, bearded dragons, chinchillas, cats, dogs, hedgehogs, hamsters and guinea pigs until their eventual transport to Edmonton where hundreds of worried pet parents anxiously awaited. through collaboration and collective effort, approximately 1200 pets were extracted, sheltered and transported out of the emergency zone. 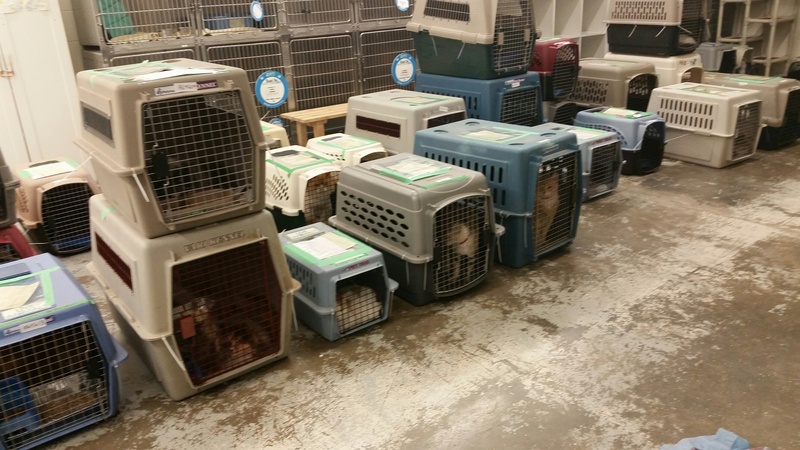 We were also able to place our shelter pets that had been evacuated by FMSPCA foster families with organizations such as AARCS and ASNTF who went to incredible lengths to pick-up and transport our shelter pets to relieve foster families, providing those pets the opportunity to be placed in an adoption program without delay. When we exited the emergency zone, we immediately began preparing for thousands of pets and pet families requiring our support upon their ability to re-enter our community. We did this by gathering data through our first Community Impact Survey in May 2016 to not only assess immediate needs but further determine supports that would be required by the community upon re-entry. This tool has been invaluable and well received. We continue to reach out to hear directly from regional pet owners. Some of what we learned, was not what we had been advised nor anticipated would take place during and post disaster. The suppliers that contacted us during the emergency and evacuation to provide food, medical supplies and pet support supplies was overwhelming. Thank you to: Hills, Boehringer, Aventix, Idexx, Summit, Medical Royal Canin, Kong, Trupanion, Quality Xray, Z Medical, Pet Valu, Pet Smart Charities of Canada, Four Feet Foundation, Edmonton Humane Society, Acana, City of Edmonton, Alberta SPCA, Royal Dutch Shell and so many more not only assisted us in procuring needed items during and post evacuation, but also assisted in replacing supplies lost, damaged or exposed during the re-entry phase. The outreach from communities across Canada and beyond, from lemonade stands, to car washes, to benefit concerts, to children’s birthday parties who in lieu of gifts collected donations and supplies for our community was profound, touching and awe inspiring. The handmade cards, the messages of hope and support, some of them marked on the bags and boxes you sent us – we read every bag, every message, every letter – we can never express how appreciated they were. They hold a place of honor in our shelter to remind us of your heartfelt wishes for our community. 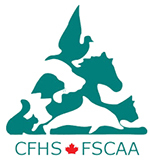 An animal welfare agency would expect certain impacts post disaster, one of which being a significant increase in animal re-homing needs. In anticipation of this we instituted free owner surrender services. It was also assumed that in-community adoption rates would decrease. This however did not hold true for our community. Adoptions increased as residents sought the mental health and wellness benefits of adding a pet to their household. Although our animal intake did increase by 29%, adoption rates also increased 18%. One of the most telling statistics from our Community Impact Surveys is almost 90% of respondents felt that pet companionship provided DIRECT BENEFITS to their well-being during and after the wildfire. Common themes included helping with anxiety, depression, stress relief, emotional support, stability and overcoming fear. Many parents commenting on the direct benefits pets had on their children. The reasons impacting pet owner surrenders or pets needing to be re-homed followed trends impacting their human counterparts including changes in family situations due to relationship breakdown, having to relocate out of the community or a change in financial circumstances. 43% of owner surrendered pets were due to an inability to secure pet friendly accommodations in the community after the loss of 2400 residential structures. In contrast, 24% of respondents indicated that they are thinking of adding a pet to their household and 17% indicated that they have already become new pet owners post wildfire. For those that became new pet owners 37% indicated it was for companionship and to prevent loneliness. 30% of respondents indicated they became new pet owners for the mental health benefits. Every animal who entered into our adoption program during the initial 6 months of re-entry and recovery has been successfully placed and adoption rates remain some of the highest in the 39 year history of the organization. Our days in shelter per animal continues to decrease. Advocating for pets to be included in your community’s emergency response plan is essential as pet owners may be reluctant to evacuate if their pet companions cannot be accommodated. Furthermore animal welfare agencies have an opportunity to educate and advocate the importance of emergency preparedness for pet owners in your jurisdiction. It is our experience that these efforts must be on going in order for a population to be prepared rather than complacent. 1. CREATE A PET EMERGENCY RESPONSE PLAN for your organization, but also have information available for pet owning households in cases of emergency if you don’t already. This creates a resiliency in pet owners and addresses their unwillingness to evacuate without their pets. Our advice – pets and humans together whenever possible to keep pet owning families stronger together. 2. We recommend you ESTABLISH A FORMAL PARTNERSHIP with a like- minded organization outside your jurisdiction. We learned in cases of large scale disasters like the wildfire in our community, you may not have electricity, you and your staff may be fleeing for your lives, your cell phones will run out of charge. Partnering with another organization in a ‘safety’ zone who can mobilize on your behalf will provide you the ability to trigger their support in setting up a donation mechanism to ensure money raised reaches your organization as this is essential to your ability to respond to ongoing, long term community needs.Furthermore, any physical donations that are being sent can be shipped to their facility. Having a location for affected residents to access needed supplies ensures they receive the consistent support they need for their pet family members. Management of the physical donations in large scale disasters is a huge undertaking you should not underestimate—transporting them, storing them, disseminating them over an extended period of time is an essential part of your planning. Your partner can also keep in contact with your management to provide communications support so that your team is able to get to safety if needed. Access to your partners’ facility to work from temporarily so that your team can continue regular updates and information sharing as well as having a central meeting point is crucial. 3. As much work as pet rescue efforts are in the first days of any disaster, WE LEARNED 90% OF THE RESPONSE AND FUNDING SUPPORT YOU WILL NEED COMES AFTER THAT RESCUE. 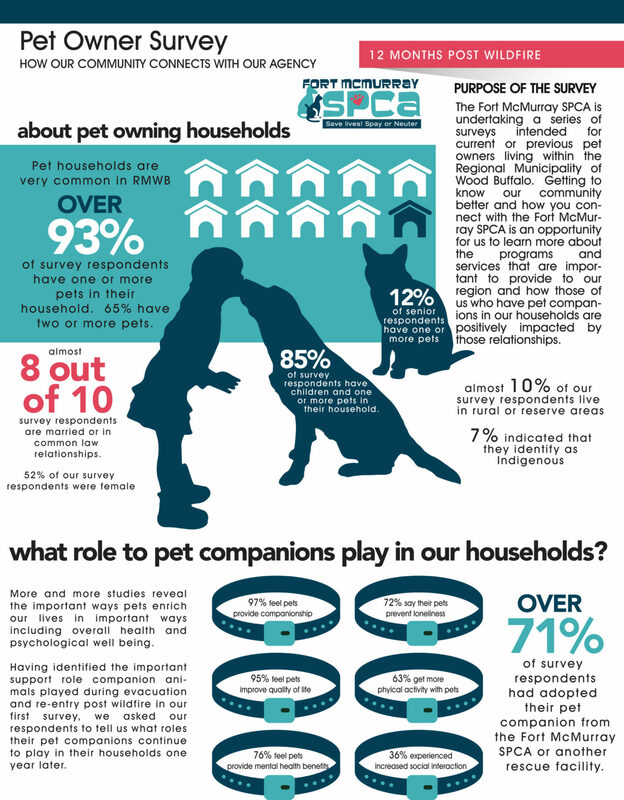 The ongoing, long-term support of pet owning households is imperative. Pet surrenders, new programming and service needs over an extended period of time should be included in your emergency and recovery planning. 4. You need to have RESOURCES AND SUPPORTS, SUCH AS WELLNESS INTERVENTION AND INITIATIVES, FOR YOUR STAFF who may themselves be impacted by the disaster and can experience PTSD, and COMPASSION FATIGUE. 5. Sharing important progressive milestones throughout the evacuation and recovery can build hope for residents during and post disaster. It is however also important for supporting agencies to COMMUNICATE WITH IN-COMMUNITY ORGANIZATIONS BEFORE SHARING; INFORMATION, IMAGES, AND VIDEOS thus ensuring your updates are respectful of those directly impacted. 6. 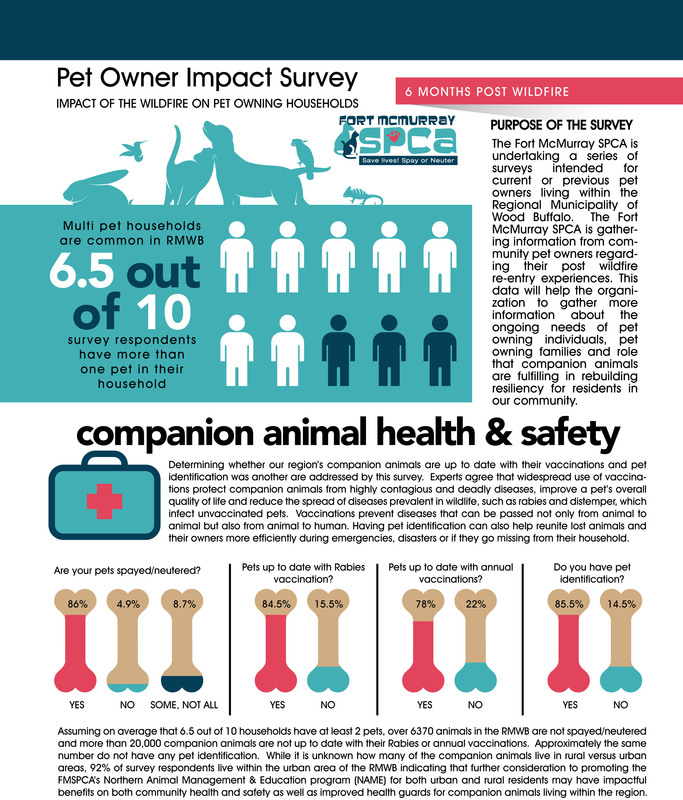 Have a tool to assess the needs of pet owning households in your community. Having owner surrender access can help prevent pet homelessness along with economic supports through a pet food and supply bank for pet owners experiencing financial hardship in trying to recover from the disaster.COMMUNITY IMPACT SURVEYS AND ANALYSIS WILL RESULT IN KNOWING RATHER THAN ASSUMING HOW THEY FEEL AND WHAT THEIR NEEDS ARE. 7. Finally a STRONG ADOPTION CAMPAIGN will keep your community connected to your mission and your efforts in finding loving forever homes for those animals in your care.